Choosing the best jack stands to fit your car is probably not the most exhilarating thing you are going to do today. Lets face it, they’re not the most exciting toy you can get for your car, nor do they have flashing lights, or do any cool tricks that you can show your friends. They are a vital piece of kit though. You don't want to be that person that gets flattened under a car that that was held up using an old rusty crate or a few cinder blocks that you found in the backyard of the house you just moved in to. Even if you don't care about losing a limb or worse, trust me your family will. So today, I'm going to run through the wonderful world of jack stands, and recommend a few options worth laying down your cash for. Why Use A Jack Stand At All? The Big Red jack stands from Torin have to be the best value jack stands that you can buy right now. They are available in 2, 3 or 6 Ton variants, so no matter what you drive they are going to keep you safe. When it comes to axle stands or car jacks, I usually play it safe and go for the heavier duty models. The 6 Ton model will support around 12,000lb per pair. So even if you don't need the extra strength now, you can safely continue to use them if you decide to upgrade to something like an SUV or truck. The ratchet height adjustment is another cool feature that you might not expect on a cheaper set of stands. It allows you to compensate for uneven ground, or to get the stand nice and snug under the car. You then have a secondary support in the form or a steel locking pin, for extra piece of mind. I also liked the set-up of the feet. The Big Red jack stands have four steel feet rather than the more common tripod configuration. Whilst four feet are harder to get level than three feet on uneven ground, they will give a sturdier grip when under load. The fact that they are steel means that they aren't going to split or change shape the way rubber of plastic covered feet would. Overall, these are a sturdy set of jack stands. The build quality is excellent, and they also meet ASME/PALD standards. 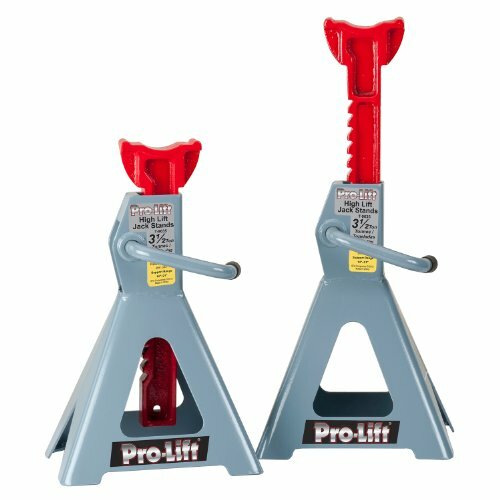 The Pro-Lift jack stands are in my opinion the best jack stands for truck and SUV owners. 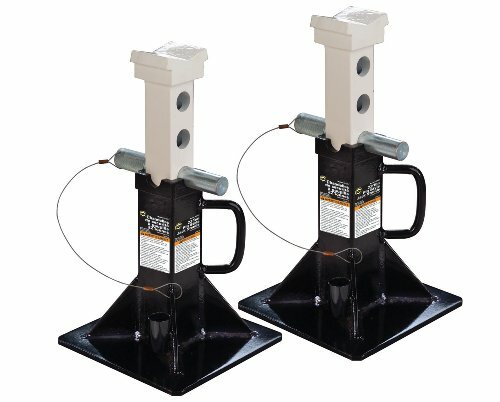 They are listed as high lift jack stands. With a 21 inch max height range, they're not the tallest on the market (the Torin Big Reds reach up to 23 inches). However, they are very sturdy heavy-weight stands. If you are getting under a 7,000lbs truck, you'll feel a lot safer with these stands supporting it. The height adjustment mechanism is also heavy duty. The adjusting handle is made from high cast iron and feels resilient enough to not bend or break over time. The only downside I can see is the lack of locking pin. Personally I wouldn't feel 100% safe getting under a car without the backup locking pin. Over time the ratcheting teeth on any jack stand can become worn or damaged, so it's important that you check them regularly. All in all, these stands are well built. The paint coating is good quality and looks like it will stand up to years of abuse. I like the red height columns, they look and feel premium. And of course these stands pass the ASME/PADE standards too. 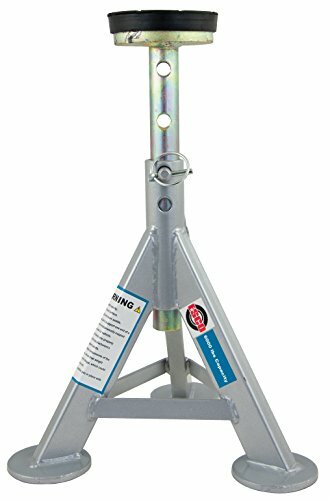 The Esco jack stand is another well made steel bodied jack stand. They're sold individually, and each stand can support up to an impressive 6000 lbs. You're probably going to need more than one if you plan on doing anything more than changing the oil of servicing the brakes, so a pair will work out decidedly more expensive than the Torin Big Reds. However, these stands are obviously built to last. They're not the prettiest jack stands you can buy, but they are powder coated, so won't chip and rust as easily as painted stands will. The welds are not the cleanest you are going to see, but they do the job. They also three have flat disc shaped feet. This design gives way more stability than spiked feet, especially if they are resting on gravel or softer ground. They also won't mark whatever it is they are resting on. One downside to these stands is the lack of ratcheting mechanism. The inner support column is held in place with a steel support pin. When using these, you set the height using the pin and then lower your car onto them using the jack. The reason I've chosen these as the best low profile jack stands is because of the removable rubber disc on top of the support column. This is included to stop the stand from damaging the underneath of your car. You can also remove it if you need to fit the stand under a vehicle with less clearance. The stands can also drop to around 13 inches in height, and about an inch less than this without the rubber stopper. I've worked on a lot of low profile German cars, that have lowered suspension or side skirts, it can be a nightmare trying to get enough clearance under them to swing a wrench. I would definitely recommend these as being one of the best jack stands for BMWs or a low profile Porsche, or even a Mustang or Corvette. These stands are also suitable for higher vehicles such as small SUVs. The round topped support column is also great for cars that have round jack points. 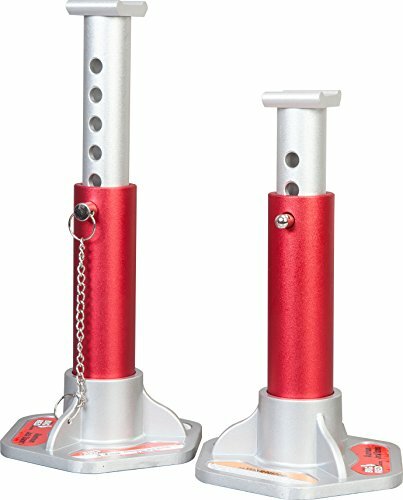 The Torin Big Red Aluminium jack stands weigh around 5lbs each. This is because they are constructed from aluminium tubing and a cast aluminium base. Lightweight jack stands are a great option if you only use them occasionally and don't want the hassle of dragging out heavy steel stands. I like the look of these stands. They're finished with a red coating that is easy on the eye, but looks fairly resilient too. Being aluminium, they are rust proof, so good for use in all conditions. The base is an interesting hexagonal shape. It's made of cast aluminium, so it's light but sturdy. The hexagonal shape makes it safer than a disc shape, and less like to roll if it were to topple. The downside to this design is that they are not as sturdy as a wider tripod set-up. If the vehicle their supporting were to move at all, I wouldn't trust them not to topple. I also wouldn't feel as comfortable about their stability when fully extended under maximum load. That said, these stands seem more suited to lighter, occasional jobs. The height range is only between 10 and 15 inches. So they are probably more suited to a quick oil change or a brake service, rather than a clutch or transmission job. Overall, I can't fault the build quality. They don't use a ratcheting mechanism to adjust the height, but the support pin looks sturdy and operates well. And like all Torin Jack Stands, they are approved by the ASME. These monster jack stands are capable up supporting a massive 44,000lbs. If you are the type of person that wants to play it extra safe, then these babies are your only option. Constructed from heavy gauge steel, they weigh over 30lbs each, so they're definitely not something you are going to carry around in your trunk. If you are going to move them around, they have a convenient handle on the side and a pocket for the support pin. The inner adjustable column is held in place using a massive support pin, that is almost an inch in diameter. There is no adjustable mechanism, but I don't think it would be possible to construct one small enough to carry a load of 11 tons. The height range is nothing to write home about at a max 19 inches But again if you want to lift 22 Tons higher than this you'd probably be better off with a full sized garage ramp! The shape of the support saddle could also be a problem for some cars that have round jack points. 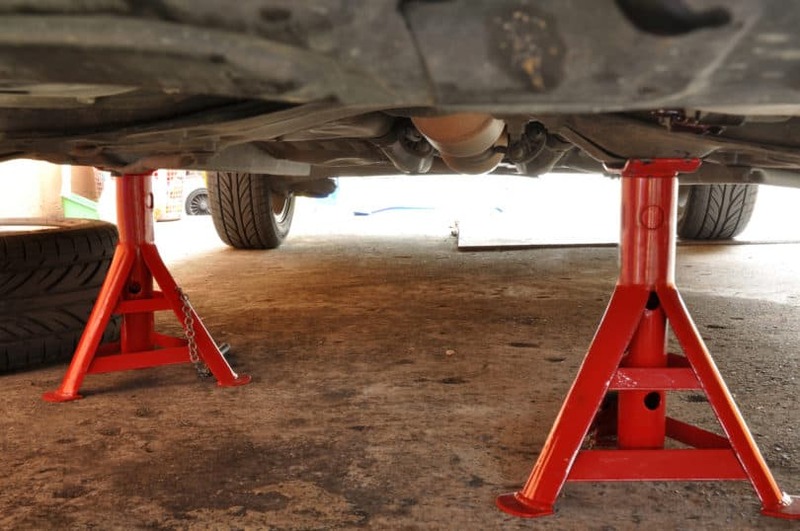 These stands are not cheap, but if you want to invest in a set of jack stands that you can pass on to your kids, then these will definitely stand the test of time. So what do you need to look for when picking a suitable jack stand? This is the maximum weight that the axle stands will support safely. Check out the weight of your car or truck in the owners handbook or online. Most stands will be advertised with a total weight rating for both stands. So a '6 Ton Capacity' weight rating means each stand will support 3 Tons independently of the other. It's best to play it safe and buy a set of stands that will support a good bit more weight than the official curb weight of your vehicle. You may want to upgrade from a car to a truck in the future. You don't want to have to replace a perfectly good set of jack stands too. You may also want to take into account your own weight. Say you're adjusting the clutch on your car or changing the fuel filter. You may need to start the engine or pump the clutch pedal, so you'll want the jack stands to take the weight of you sitting in the drivers seat and the weight of the vehicle too. Here we are concerned with the materials used to make the stand body, adjustable support column and locking pin.Most jack stands are constructed from coated high-grade steel. Obviously steel is strong, but it's also heavy and can rust. The other option is an aluminium body. This is lightweight, won't rust and is just as strong as steel when used in certain types of stand designs. The most common type of base when it comes to jack stands, is the pyramid shaped base. Three legs, in this case are better than four as they allow for stability on an uneven surface. It's also important to note what's on the bottom of the legs. If the feet of the stand are sharp or exposed then they might scratch your garage floor or concrete driveway. Jack stands with a single hexagonal or circular base are not be as stable as the wider tripod configuration. So if you plan on supporting a heavier vehicle at a greater height, it's important to choose a stands with wider legs. Chances are you'll want to move around your axle stands in between jobs. If they are too big or too heavy this can become a pain. Choosing a lightweight aluminium option, or a smaller overall design if you need the extra strength might be a good idea to save your back. Most stands on the market are adjustable by using a steel locking pin with or without an integrated ratcheting mechanism. If you are working on uneven ground, or your car is tilted, it can be hard to lock the axle stand securely in place. The ratcheting mechanism allows you to make small adjustments in height to get a better, safer fit. In all cases, the locking pin holds the adjustable inner lifting column in place. This is a backup for the adjustment mechanism that can become worn or rusted over time. Personally, I wouldn't get under a car or truck unless the jack stand has a locking pin in place. Most jack stands will have either a v-shaped top on the support column, or a flat circular block with grooves. Generally, the v-shaped type are used for supporting axles or subframes. If you want to put position the axle stand under a jack point, the flat topped type might be better. Different cars have different shaped jack points, so some axle stands have removable rubber blocks to accommodate square or circular jack points. The 'Safety Standard for Portable Automotive Service Equipment' published by The American Society of Mechanical Engineers, outlines the safety standards that all portable auto tools need to adhere to. It's important that the stands that you choose exceed these requirements. Over the years I've seen cars supported by old wheels, cement blocks, dog crates (the dog wasn't in it at the time! ), kitchen chairs... 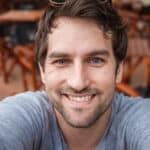 I've even come across websites that will show you how to make a homemade jack stand from scrap wood. Apart from the obvious safety concerns, most of these crazy make-shift designs are usually shoved in under the wheels while the car balances on a jack. So what do you do when you want to take a wheel off? Now granted, if you do a search on Pintrest you'll come across some good looking homemade jack stands. They are usually constructed from steel, and welded together by someone that is handy with a welding torch and a can of spray paint. But the problem is, whilst these stands will in theory protect you from getting squashed by your car, they haven't passed any safety tests. There is no guarantee they will be safe with YOUR car. All jack stands sold today, need to meet certain minimum safety standards. These tests relate to the weight bearing capacity of each of the stands in a pair, and how well they support the weight over a period of time. The ASME publish new safety standards for auto equipment every few years. It's a good idea to only buy jack stands that meet or exceed these standards. So maybe the question should be, why buy an approved set of jack stands, instead of making your own? 1. Make sure the vehicle is parked on level, solid ground before you jack it up. 3. When positioning the jack stand, make sure it's level (all feet are touching the ground) and that it is not overextended in height. 4. If there is a locking pin, use it to secure the height of the jack stand. 5. Make sure you don't over exceed the weight capacity of the jack stand. Some jack stand manufacturers quote the maximum weight capacity per pair, not for each stand. What are jack stands used for? Jack stands are used to safely hold a vehicle off the ground when undergoing maintenance or inspection. They are used if access to a full sized vehicle lifter or ramps is not possible or suited to the job. They are also a cheaper alternative to a ramp for longer restoration jobs, or for quick offsite fixes when you are using a jack. How safe are jack stands? Properly maintained jack stands are very safe to used, when used properly. All jack stands must conform to the 'Safety Standard for Portable Automotive Service Equipment' published by The American Society of Mechanical Engineers. Where to put jack stands? Jack stands must only be used to support the weight of a vehicle in certain places. This can vary from vehicle to vehicle, but is usually in places such as one of the jacking points, the subframe and some fixed suspension parts. You can also use jack stands to support vehicle parts while you work on them, such as engines, wheel hubs, differentials, gearboxes. How many jack stands do I need? You should always use enough jack stands to exceed the weight capacity needed to safely hold up a vehicle. If the vehicle weighs 2 tons, then you need enough individual jack stands to take this weight. Sometimes this means using 2 or more jack stands. Jack stands vs ramps, which are safer? Both have their uses, and are safe if used properly. Ramps can be more secure if they are properly fixed to the ground. Can you use 4 jack stands? Yes you can if necessary, although I wouldn’t recommend it in all cases. It’s usually safer to keep at least 2 wheels of a vehicle on the ground, with wheel chocks in place. This will stop the vehicle from moving and potentially coming off the stands. Yes they can. If jack stands are not maintained they can rust and break as they get older. They can also fail if they are exposed to too much weight or are used in a way that was not intended by the manufacturer. Are jack stands rated in pairs? Some are and some aren’t. It’s very important that you check this before using them. 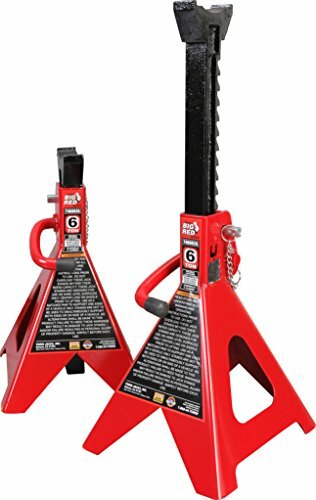 Are double locking jack stands necessary? No, but I’d always recommend using a jack stand that has a heavy locking pin. Ratchet jack stands are handy for getting the right height, but the teeth can weaken or rust over time and this can lead to failure. Can you put jack stands on the axle? It’s not recommended for standard sized vehicles as this could damage the axle and potentially cause and accident. It’s much safe to use a jack stand on something more robust like the subframe or a dedicated jacking point.